Background: High-density lipoprotein (HDL), low-density lipoprotein (LDL), triglyceride (TG), and total cholesterol (TC) are associated with maternal hormonal changes which can lead to pregnancy complications. High lipid levels during pregnancy may be accompanied by an increased risk of spontaneous preterm labor. The purpose of this review was to determine the relationship between lipid profiles in pregnancy and preterm delivery. Methods: A systematic search was performed in PubMed, EMBASE, Web of Science, Scopus, and Science Direct databases to find cross-sectional, case-control, and cohort studies on the associations between lipid profiles in pregnancy and preterm delivery. The search results were limited to papers published during 2000-2018. The quality of the selected studies was assessed based on the Strengthening the Reporting of Observational Studies in Epidemiology (STROBE) checklist. Finally, a total of 25 eligible high-quality papers were reviewed. Results: A high maternal TG level in the first trimester of pregnancy was identified as a significant risk factor for preterm delivery. Low TG, HDL-cholesterol (HDL-C) and LDL-cholesterol (LDL-C) levels were uniquely associated with an increased risk of preterm delivery. High TC, TG, and LDL-C levels increased the risk of spontaneous preterm labor. A further association was found between high TG and TC levels and an elevated risk of preterm labor before 34 weeks of gestation. The risk of preterm labor before 34 weeks and during the 34th-37th weeks of gestation increased with increasing TG and TC levels. Moreover, overweight women who had a delivery before 34 weeks exhibited significant increases in TC and LDL concentrations during early pregnancy. Conclusion: Lipid metabolism undergoes complicated changes in pregnancy. Lipid levels (LDL, HDL, TC, and TG) above or below the normal range during pregnancy increase the risk of preterm delivery. Considering the significance of maternal lipid metabolism in the incidence of preterm delivery, lipid profile screening in early pregnancy can largely contribute to the prevention of preterm delivery. Further studies are warranted to meticulously examine the effects of lipid profile on preterm delivery. Preterm delivery is one of the main causes of pre- and postnatal morbidity and mortality in developed countries. Preterm delivery accounts for 75-90% of neonatal and prenatal mortalities and serves as the main cause of short- and long-term neonatal defects 1. About 13 million spontaneous preterm deliveries occur around the world each year. The incidence rates differ in different countries2 and have been reported as 2.9% in Iran 3. Preterm labor is associated with increased respiratory disorders, pulmonary edema, and impaired glucose tolerance in the newborn 4. Premature infants may develop a number of short- and long-term conditions including respiratory distress syndrome, bronchopulmonary dysplasia, apnea of prematurity, hyperbilirubinemia, nosocomial infections, immunodeficiency, patent artery duct, intraventricular hemorrhage, bacterial and fungal sepsis, precocious retinopathy of prematurity, necrotizing enterocolitis, food intolerance, mental retardation, blindness, and hearing loss 5. While approximately 10-15% of highly premature neonates show symptoms of neurodegenerative defects, such as cerebral palsy, more complications including learning disability and emotional problems may be seen in 50% of these infants 1. Despite advancements in neonatal care, premature infants are at higher risk for mortality and those who survive may experience neurodevelopmental delay 6. A variety of factors, some of which have not been clearly identified, may be responsible for spontaneous preterm delivery. Some studies have reported relationships between risk factors for maternal cardiopulmonary complications and undesirable pregnancy outcomes, such as low gestational age and low birth weight. Associations have also been established between HDL, LDL, TG, and TC levels and maternal hormonal changes, and in turn, pregnancy problems and changes in the fetal development process 78. While the exact mechanisms through which these changes in the maternal plasma lipid profile affect fetal development and birth are not clear, recent studies have highlighted the significant biochemical and physiological effects of cholesterol on the function of fetal membranes and neonatal neurodevelopment. The transfer of maternal cholesterol to the fetus through the umbilical cord might justify these effects. A previous study reported that low birth weight infants had lower HDL levels compared to their term counterparts 910. There is still controversy over the association between maternal lipid profile and preterm delivery. In several studies, both high and low HDL, LDL, TG, and TC levels almost doubled the risk of spontaneous preterm delivery 11. Some studies, on the other hand, have used maternal serum screening and rejected any relationships between the highest/lowest lipid levels and preterm labor 12. A systematic review found that the risk of spontaneous preterm delivery could be increased by high TG levels, but was not affected by HDL-C and LDL-C levels 13. Meanwhile, Heida et al. (2017) reported lower TC and LDL-C levels in women with spontaneous preterm delivery, but could not establish a significant relationship between undesirable lipid levels and preterm delivery 14. Since changes in fat metabolism during pregnancy can be associated with adverse pregnancy outcomes, this review aimed to determine the association between lipid profiles during pregnancy and preterm delivery. The Preferred Reporting Items for Systematic Reviews and Meta-Analyses (PRISMA) guidelines were followed in the report of this study 15. The required data were collected by searching various combinations of a number of keywords, i.e. premature birth OR preterm delivery OR preterm labor AND lipid profile OR cholesterol OR high-density lipoprotein OR low-density lipoprotein OR triglyceride, in valid databases including MEDLINE, ISI Web of Science, PubMed, EMBASE, Scopus, ProQuest, and Science Direct. Cohort and case-control studies published in English or Persian during 2000-2018 were included if they evaluated the relationship between lipid profiles during pregnancy and preterm labor (from the 28-37th week of gestation) in mothers who had no particular medical conditions (preeclampsia or diabetes), and gave birth to a singleton infant through vaginal delivery. Case report studies of infants with low Apgar score (<7), women with multifetal pregnancy, and studies with incomplete information were excluded. After the initial search, 1149 studies were extracted and independently evaluated by two authors to determine eligibility. Any cases of disagreement were resolved through a consensus. As a result, 434 irrelevant or duplicate articles were excluded. The titles and abstracts of the remaining 715 studies were then assessed and 545 more papers were excluded. Evaluating the full texts of the remaining 170 articles resulted in the exclusion of 145 ineligible articles and confirmed the eligibility of 25 papers (Figure 1). The adherence of quantitative studies to the Strengthening the Reporting of Observational Studies in Epidemiology (STROBE) checklist 1617 was evaluated as a measure of their quality. Studies were classified as high-, medium-, and low-quality if they adhered to all seven items, six items, and two or more items of the STROBE, respectively. Study selection and validity assessment were independently performed by two authors and cases of disagreement were resolved by consulting a third researcher. The required data included the first author’s name, publication year, study design, country of study, sample size, gestational age at sampling and delivery, outcomes, odds ratio (OR), risk ratio (RR), mean, and standard deviation (SD) of TC, TG, HDL and LDL. The data were extracted from all studies and entered into the analysis. All the 25 studies selected after the search process met the inclusion criteria and showed high quality according to their adherence to the STROBE checklist (Figure 1). As seen in Table 1Table 2Table 3Table 4Table 5Table 6Table 7, the sample size of the selected studies ranged between 80 and 9938 women and provided a pool of 31833 women. These women were of different ages and were selected from different countries including USA (n=8), China (n=4), Iran (n=2), Japan (n=2), Netherlands (n=2), Turkey (n=1), India (n=1), Greece (n=1), Nigeria (n=1), Finland (n=1), Canada (n=1), and Spain (n=1). The selected studies had cohort or case-control designs (n=17 and n=8, respectively). Evaluating the results of the selected studies suggested high maternal TG level in the first trimester of pregnancy as an important and significant factor in preterm delivery. Low TG, HDL-C and LDL-C levels were exclusively related to the increased risk of preterm delivery. High TC, TG and LDL-C levels were also associated with an elevated risk of spontaneous preterm labor. A further association was observed between high TG and TC levels and increased risk of preterm labor before the 34th week of pregnancy and during the 34th-37th weeks. Moreover, considerably high TC and LDL levels were found in overweight women who had a delivery before 34 weeks Table 8Table 9. Emet 2013 Trimester 1:SD: 47.81 Trimester 1: SD :44.15 Trimester 1:SD:21.16 Trimester 1:SD: 101.89 - Lipid metabolism undergoes complex changes during pregnancy.- There was no significant relationship between changes in lipid metabolism during pregnancy and infant’s weight in the third month after birth. Jin1 2016 OR :0.80 OR: 0.83 OR: 1.05 OR: 1.04 - Maternal lipid metabolism plays an important role in preventing pregnancy complications and adverse birth outcomes. Vrijkotte 2012 OR:0.93SD:0.87 NR NR OR:0.83SD: 0.55 - High maternal TG levels in the first trimester of pregnancy significantly increased the risk of induced preterm labor. Kelishadia 2007 M:76.9SD:28.9 M: 34.1SD: 11.7 M: 30.1 SD: 9.4 M: 67.5 SD: 20.1 - Found significant differences in the cord lipid profile of neonates with small for gestational age. MUDD 2012 SPTD:OR:2.09 SPTDOR: 2.04 SPTDOR:1.86 SPTDOR: 1.0 - Low TC, LDL-C, and HDL-C levels independently resulted in modest elevations in the risk of medically indicated preterm delivery.- There were associations between high TC, LDL-C, and TG levels and elevated risk of SPTD. Shoji2013 M :85SD:24.8 M : 35.5SD: 15.4 M : 29.0SD: 8.6 M : 26.9SD: 18.0 - Lipid and apolipoprotein metabolism, as well as atherogenic indices at birth, in preterm infants may be affected by prematurity and poor fetal growth. Yonezawam2009 CaseSD: 2.0 CaseSD: 0.8 CaseSD: 1.3 CaseSD: 2.1 - 34 weeks of gestation was identified as a critical period for TG metabolism.- Preterm and term neonates had no differences in terms of HDL-C and HDL-TG levels. Chen 2017 CaseSD:0.051 CaseSD: 0.046 CaseSD: 0.016 CaseSD: 0.048 - Maternal lipid levels differ between different ethnicities.- Higher HDL-C and apoA1 increased the risk of SPTD and this association was independent of ethnicity. Catov 2007 37-42SD:50.5 37-42SD:44.8 37-42SD:18.7 37-42SD:60.2 - Increments in cholesterol and TG levels very early in pregnancy increased the risk of preterm delivery before 34 weeks (by 2.8 folds) and during 34-37 weeks (by 2 folds).- Women who delivered at 34 weeks had an altered TG adaptation to pregnancy during the first 21 weeks. Heida M: 5.98 M: 3.24 M: 1.75 M: 2.29 - SPTD had no significant associations with unfavorable lipid levels or cardiovascular biochemical risk factors. Grace2017 Preterm:SD: 46.64 Preterm:SD: 0.75 Preterm:SD: 0.37 Preterm:SD: 64.76 - Particle concentrations of LDL and HDL were each independently associated with gestational age at delivery for all deliveries or spontaneous deliveries before 37 weeks of gestation. Qiu 2017 Preterm:SD:1.81 Preterm:SD: 1.23 Preterm:SD: 0.66 Preterm:SD: 3.47 - The preterm group had higher maternal serum TG,TC, and LDL-C levels, compared to the control group. - Higher serum TC and LDL-C levels, but not HDL-C level, were seen in premature infants than in the control group. Li 2015 Preterm:SD: 0.44 Preterm:SD: 0.72 Preterm:SD: 0.36 Preterm:SD: 1.21 - Lower maternal TC, TG, HDL, and LDL levels and higher umbilical cord TC, HDL, and LDL levels were observed in cases of SPTD.- Maternal TG and LDL levels were associated with different genotypes of the HMGCR gene rs12916 loci. Therefore, HMGCR may be a susceptible gene for PTB. Ghodke 2017 SecondSD: 27.200 SecondSD: 10.64 SecondSD: 4.03 SecondSD: 7.73 - Triglyceridemia during early pregnancy was associated with an increased risk of preterm labor. However, TC, HDL, and LDL levels cannot be used as predictors of preterm delivery. Catov 2017 Preterm:SD: 27.8 Preterm:SD: 21.9 Preterm:SD: 11.7 Preterm:SD: 63.2 - Early pregnancy levels of very low density lipoprotein (VLDL) were lower in women with subsequent PTB, especially those with high TG, than in women with term delivery.- The impaired lipid response necessary for placentation and fetal growth might play a role in the pathogenesis of PTB. Wang 2017 PretermSD: 0.80 PretermSD: 0.69 PretermSD: 0.46 PretermSD: 0.69 - Elevations in early pregnancy TC, TG, and LDL-C levels, along with a reduction in first trimester HDL-C, increased the incidence of adverse pregnancy outcomes.- The risk of PTB was higher in women with metabolic syndrome in early pregnancy. Maymunah 2014 M: 169.13 SD: 16.22 NR NR NR - Hypercholesterolemia which in turn is associated with preterm in full term neonates. L Chatzi 2009 RR: 1.24 RR: 1.17 RR: 1.08 RR: 1.13 - Higher risk of PTB was observed in women with metabolic syndrome in early pregnancy. Catov 2010 TermSD: 32.9 TermSD: 29.0 TermSD: 13.1 TermSD: 35.5 - Both elevations and reductions in pre-pregnancy cholesterol levels increase the risk of PTB and early PTB (before 34 weeks). Harville 2011 M: 5.1 RR: 1.10 M: 3.1 RR: 1.11 M: 1.6 RR: 0.96 M: 1.0 RR: 1.07 - High pre-pregnancy lipid levels can serve as predictors of cardiovascular disease and PTB risk. NIROMANESH 2012 M: 294.1 SD:17.3 M: 169.8 SD: 18.9 M: 48.5 SD: 9.8 M: 11SD: 24.4 - Hypertriglyceridemia had a positive relation with PTB. Further research is required to determine the cut-off lipid levels before and during pregnancy and clarify their associations with poor pregnancy outcomes. Kramer 2009 CaseSD: 1.1 CaseSD: 0.8 CaseSD: 0.4 NR - PTB may share similar risk factors (high LDL and TC and low HDL) with adult coronary heart disease and stroke. Edison 2007 Low TC SD: 1.2 NR NR NR - TC 10th population percentile had a strong relationship with PTB in white women who had no other risk factors. Bartha 2011 Case:SD:40.01 Case:SD: 36.07 Case:SD:18.38 Case:M: 175.04 SD: 64.14 - Women with spontaneous pregnancy loss had low cholesterol to HDL-C ratio. Such a low ratio is also associated with inflammation. Allem 2013 First trimester :OR: 1.03 First trimester:OR:1.01 First trimester :OR:0.96 First trimester :OR:1.02 - No significant associations were found between PTB and either the highest or the lowest quartile of any lipid measurements. Strengthening the Reporting of Observational Studies in Epidemiology (STROBE) statement for the selected studies . Given the significance of preterm delivery, we reviewed the results of high-quality studies on the associations between lipid levels during pregnancy and preterm birth. Our review indicated high maternal TG level in the first trimester of pregnancy as a significant risk factor for preterm delivery. In a case-control study, Catov et al. (2007) reported an association between lipid profile and preterm labor, i.e. high TG and cholesterol levels increased the risk of preterm labor before the 34th week and during the 34th-37th weeks of gestation. Overweight women who delivered before 34 weeks had particularly higher levels of cholesterol and LDL. TG levels were also increased in underweight women and these women showed lower TG responses during the first half of pregnancy 25. Vrijkotte et al. (2012) investigated maternal lipid profile in early pregnancy and its association with pregnancy complications and concluded that high first trimester TG levels could be a significant risk factor for preterm delivery 40. Yonezowa et al. (2009) examined umbilical cord lipids in preterm infants and confirmed low TG levels in preterm infants. They, thus, identified 34 weeks of pregnancy as a critical period for TG metabolism and reported considerable increments in umbilical cord TG levels during the 32th-34th weeks 23. Ghodake et al. (2017) established an association between early pregnancy TG levels and preterm delivery. However, no such relations were found in cases of TC, LDL, and HDL levels 29. Catov et al. (2017) examined the heterogeneity of lipoproteins during pregnancies leading to preterm delivery and showed that preterm labor was seen in women with high TG levels. However, LDL-C had no direct relation with preterm delivery 30. Likewise, Niromanesh et al. (2012) underlined the positive association between hypertriglyceridemia and preterm delivery 36. We also found evidence of the relationship between low TG, HDL-C, and LDL-C levels and increased risk of preterm delivery. Indeed, elevations in TC, TG, and LDL-C levels were also associated with an increased risk of spontaneous preterm labor. According to Chen et al. (2017), despite differences in lipid levels of different races and ethnicities, higher HDL-C levels during early pregnancy universally increased the risk of spontaneous preterm labor 24. Catov et al. (2014) identified high HDL levels as a risk factor for spontaneous preterm labor 41. Kramer et al. (2009) investigated the vasculopathic and thrombophilic risk factors for preterm delivery and highlighted the contribution of reductions in maternal lipids to the incidence of preterm labor. They further noted the associations between spontaneous preterm delivery and elevated TC and LDL levels. Their findings also suggested the protective role of high HDL levels in preterm delivery 37. Kaser et al. (2001) evaluated lipid levels in infants and reported small for gestational age (SGA) neonates to have lower HDL, LDL, and TC levels, compared to appropriate for gestational age (AGA) infants 42. Moreover, Heida et al. (2017) found no correlations between spontaneous preterm delivery and unfavourable lipid levels or cardiovascular biochemical risk factors in mothers 14. Grace et al. (2017) examined the relationship between maternal serum lipoproteins and gestational age, and reported LDL and HDL concentrations to be independently related with gestational age at preterm delivery 26. Qiu et al. (2017) studied maternal serum lipid profiles and homocysteine ​​in late pregnancy and showed higher TC and LDL levels in mothers with preterm delivery than in those with term delivery. In contrast, mothers with term delivery had higher HDL levels compared to those with preterm delivery 27. Moreover, Li et al. (2015) investigated the relationships between lipid levels and single-nucleotide polymorphisms of APOE, ABCA1, and HMGCR genes in women with preterm labor. They found that HDL, TG, and LDL levels decreased in mothers with preterm delivery. They also established relationships between maternal TG and LDL levels and HMGCR genotype, and concluded that HMGCR might be a suitable gene for preterm delivery 28. Wang et al. (2017) found associations between elevations in first trimester TG, TC, LDL, and HDL levels and risk of preterm labor. On the other hand, low LDL, TG, and TC levels and a high HDL level during pregnancy might have a protective role against preterm delivery 31. Maymunah et al. (2014) studied hypercholesterolemia as one of the predictors of undesirable pregnancy outcomes and reported that both high maternal age and body mass index (BMI) increased maternal cholesterol levels and, thus, the risk of preterm delivery 32. Harville et al. (2011) demonstrated that high LDL, TG and TC levels before pregnancy could increase the risk of cardiovascular diseases and premature labor 35. Additionally, women with preterm labor reportedly had lower HDL-C concentrations 39. Our review indicated associations between high TG and TC levels and increased risks of preterm delivery before 34 weeks and at 34-37 weeks of pregnancy. Catov et al. (2010) presented evidence of an association between pre-pregnancy cholesterol levels and the risk of preterm birth. This association was independent of age, race, parity, BMI, blood pressure, and physical activity during labor. There was also a relationship between cholesterol and labor before 34 weeks in women with normal blood pressure. No associations could be established between TG, HDL, and LDL concentrations, with preterm labor 34. Steffen et al. (2007) examined changes in the cholesterol metabolism gene in infants born between 22 and 36 weeks and their mothers. They concluded that changes in the cholesterol metabolism gene in mothers and infants were associated with preterm labor and low birth weight 43. These results indicate that genetic markers can help identify mothers who are at risk for dyslipidemia and preterm labor. Toleikytei (2011) did not detect any differences in the risk of preterm labor between women with hypercholesterolemia and other women of childbearing age 44. Edison et al. (2007) highlighted the involvement of low TC levels in the pathogenesis of preterm delivery. They explained that poor nutritional status contributed to low TC levels which, in turn, increased the risk of undesirable pregnancy outcomes and preterm labor 38. Liu-x (2011) studied the effect of pre-pregnancy BMI on premature labor and concluded that high levels of TC may be accompanied by other risk factors, such as unfavourable lifestyle and dietary habits 45. A study on the risk factors for spontaneous preterm delivery in adolescents 46 revealed that high BMI and elevated TC levels during pregnancy could have a protective effect against spontaneous premature labor in teen pregnancies 46. According to our review, overweight women with preterm labor (before 34 weeks) presented with significantly higher TC and LDL concentrations during early pregnancy. Chatzi et al. (2009) examined the relationship between metabolic syndrome in pregnancy and the risk of preterm delivery. They showed that high early pregnancy cholesterol increased the risk of preterm delivery 33. Shoji et al. (2014) stated that umbilical cord lipid profiles widely varied depending on maternal and infant weights and gestational age. Premature fetal development may affect lipid metabolism and atherogenic indices. A critical period for neonatal TG metabolism is 34 weeks during which premature infants have lower TG levels 22. Late pregnancy TG concentrations have been stated to be independently associated with a reduced risk of SGA 19. TC and LDL levels in AGA infants tend to be higher than those of SGA neonates 19. Another study further reported that TC and LDL levels were higher in AGA infants than in SGA neonates (48). These observations signify the importance of maternal lipid profile screening for preventing pregnancy complications. Lipid metabolism undergoes complicated changes in pregnancy. Lipid levels (LDL, HDL, TC and TG) above or below the normal range during pregnancy would increase the risk of preterm delivery. Considering the significance of maternal lipid metabolism in the incidence of preterm delivery, lipid profile screening in early pregnancy can largely contribute to the prevention of preterm delivery. Further studies are warranted to meticulously examine the effects of lipid profile on preterm delivery. A limitation of this study was the small number of studies about the effects of lipid profile on preterm delivery. Another limitation was the use of different designs and sample sizes in the selected studies. A third limitation, which prevented us from performing a meta-analysis, was the difference of the measured indices in the selected studies. This article is distributed under the terms of the Creative Commons Attribution License (CCBY4.0) which permits any use, distribution, and reproduction in any medium, provided the original author(s) and the source are credited. FA and ZA developed main idea. ZA is responsible for assessment of eligibility criteria of papers. FA is responsible for evaluation of full text and data gathering. All authors read and approved the final manuscript. The study was approved by the Student Research Committee, Shahid Beheshti University of Medical Sciences,Tehran, Iran. The authors wish to express their gratitude to the mentioned committee. Niromanesh S, Shirazi MAHBOOBEH, Dastgerdy E, Sharbaf FR, Shirazi M, Khazaeipour Z. Association of hypertriglyceridaemia with pre-eclampsia, preterm birth, gestational diabetes and uterine artery pulsatility index. Natl Med J India. 2012; 25 : 265-267 . Alleman Brandon W, Smith Amanda R, Byers Heather M, Bedell Bruce, Ryckman Kelli K, Murray Jeffrey C, Borowski Kristi S. A proposed method to predict preterm birth using clinical data, standard maternal serum screening, and cholesterol. American journal of obstetrics and gynecology. 2013; 208 : 472. e1-472. e11 . Bartha J. L., Fernández-Deudero A., Bugatto F., Fajardo-Exposito M. A., González-González N., Hervías-Vivancos B.. Inflammation and cardiovascular risk in women with preterm labor. Journal of Women\'s Health. 2012; 21 : 643-8 . Kramer M. S., Kahn S. R., Rozen R., Evans R., Platt R. W., Chen M. F.. Vasculopathic and thrombophilic risk factors for spontaneous preterm birth. International Journal of Epidemiology. 2009; 38 : 715-23 . Edison R. J., Berg K., Remaley A., Kelley R., Rotimi C., Stevenson R. E.. Adverse birth outcome among mothers with low serum cholesterol. Pediatrics. 2007; 120 : 723-33 . Harville E. W., Viikari J. S., Raitakari O. T.. Preconception cardiovascular risk factors and pregnancy outcome. Epidemiology (Cambridge, Mass.). 2011; 22 : 724-30 . Catov J. M., Ness R. B., Wellons M. F., Jacobs D. R., Roberts J. M., Gunderson E. P.. Prepregnancy lipids related to preterm birth risk: the coronary artery risk development in young adults study. The Journal of Clinical Endocrinology and Metabolism. 2010; 95 : 3711-8 . Chatzi L., Plana E., Daraki V., Karakosta P., Alegkakis D., Tsatsanis C.. Metabolic syndrome in early pregnancy and risk of preterm birth. American Journal of Epidemiology. 2009; 170 : 829-36 . Maymunah A. O., Kehinde O., Abidoye G., Oluwatosin A.. Hypercholesterolaemia in pregnancy as a predictor of adverse pregnancy outcome. African Health Sciences. 2014; 14 : 967-73 . Wang C., Zhu W., Wei Y., Su R., Feng H., Hadar E.. The associations between early pregnancy lipid profiles and pregnancy outcomes. Journal of Perinatology. 2017; 37 : 127-33 . Catov J. M., Mackey R. H., Scifres C. M., Bertolet M., Simhan H. N.. Lipoprotein Heterogeneity Early in Pregnancy and Preterm Birth. American Journal of Perinatology. 2017; 34 : 1326-32 . Ghodke B., Pusukuru R., Mehta V.. Association of Lipid Profile in Pregnancy with Preeclampsia, Gestational Diabetes Mellitus, and Preterm Delivery. Cureus. 2017; 9 : e1420 . Li L., Hua J., Jian-Ping H., Yan L.. Association between the lipid levels and single nucleotide polymorphisms of ABCA1, APOE and HMGCR genes in subjects with spontaneous preterm delivery. PLoS One. 2015; 10 : e0135785 . Qiu X., Gao F., Qiu Y., Bao J., Gu X., Long Y.. Association of maternal serum homocysteine concentration levels in late stage of pregnancy with preterm births: a nested case–control study. The Journal of Maternal-Fetal & Neonatal Medicine. 2017; ••• : 1-5 . Grace M. R., Vladutiu C. J., Nethery R. C., Siega‐Riz A. M., Manuck T. A., Herring A. H.. Lipoprotein particle concentration measured by nuclear magnetic resonance spectroscopy is associated with gestational age at delivery: a prospective cohort study. BJOG. 2017 . Emet T., Ustüner I., Güven S. G., Balık G., Ural ÜM, Tekin Y. B.. Plasma lipids and lipoproteins during pregnancy and related pregnancy outcomes. Archives of Gynecology and Obstetrics. 2013; 288 : 49-55 . Jin W. Y., Lin S. L., Hou R. L., Chen X. Y., Han T., Jin Y.. Associations between maternal lipid profile and pregnancy complications and perinatal outcomes: a population-based study from China. BMC Pregnancy and Childbirth. 2016; 16 : 60 . Vrijkotte Tanja GM, Algera Sietske J, Brouwer Ingeborg A, van Eijsden Manon, Twickler Marcel B. Maternal triglyceride levels during early pregnancy are associated with birth weight and postnatal growth. The Journal of pediatrics. 2011; 159 : 736-742. e1 . Kelishadi R., Badiee Z., Adeli K.. Cord blood lipid profile and associated factors: baseline data of a birth cohort study. Paediatric and Perinatal Epidemiology. 2007; 21 : 518-24 . Mudd L. M., Holzman C. B., Catov J. M., Senagore P. K., Evans R. W.. Maternal lipids at mid-pregnancy and the risk of preterm delivery. Acta Obstetricia et Gynecologica Scandinavica. 2012; 91 : 726-35 . Shoji H., Murano Y., Mori M., Matsunaga N., Ohkawa N., Suganuma H.. Lipid profile and atherogenic indices soon after birth in Japanese preterm infants. Acta Paediatrica (Oslo, Norway). 2014; 103 : 22-6 . Yonezawa R., Okada T., Kitamura T., Fujita H., Inami I., Makimoto M.. Very low-density lipoprotein in the cord blood of preterm neonates. Metabolism: Clinical and Experimental. 2009; 58 : 704-7 . Chen X., Scholl T. O., Stein T. P., Steer R. A., Williams K. P.. Maternal circulating lipid profile during early pregnancy: Racial/ethnic differences and association with spontaneous preterm delivery. Nutrients. 2017; 9 : 19 . Catov Janet M, Bodnar Lisa M, Kip Kevin E, Hubel Carl, Ness Roberta B, Harger Gail, Roberts James M. Early pregnancy lipid concentrations and spontaneous preterm birth. American journal of obstetrics and gynecology. 2007; 197 : 610. e1-610. e7 . Heida Karst Y, Kampman Marlies A, Franx Arie, Laat Monique W De, Mulder Barbara J, Post Joris A Van der, Bilardo Catia M, Pieper Petronella G, Sollie Krystyna M, Sieswerda Gertjan T. Cardiovascular biochemical risk factors among women with spontaneous preterm delivery. International journal of gynecology & obstetrics. 2018; 141 : 206-211 . Beck S., Wojdyla D., Say L., Betran A. P., Merialdi M., Requejo J. H.. The worldwide incidence of preterm birth: a systematic review of maternal mortality and morbidity. Bulletin of the World Health Organization. 2010; 88 : 31-8 . Shapiro-Mendoza C.K., Lackritz E.M.. Epidemiology of late and moderate preterm birth. Seminars in Fetal and Neonatal Medicine. 2012; 17 (3) : 120-125 . Vakilian K., Ranjbaran M., Khorsandi M., Sharafkhani N., Khodadost M.. Prevalence of preterm labor in Iran: A systematic review and meta-analysis. International Journal of Reproductive Biomedicine (Yazd, Iran). 2015; 13 : 743-8 . Conde-Agudelo A., Papageorghiou A. T., Kennedy S. H., Villar J.. Novel biomarkers for the prediction of the spontaneous preterm birth phenotype: a systematic review and meta-analysis. BJOG. 2011; 118 : 1042-54 . Cunningham F, Leveno Kenneth, Bloom Steven, Spong Catherine Y, Dashe Jodi. Williams obstetricsMcgraw-hill 2014. Mathews T., MacDorman M. F.. Infant mortality statistics from the 2007 period linked birth/infant death data set. National vital statistics reports: from the Centers for Disease Control and Prevention, National Center for Health Statistics. 2011; 59 : 1-30 . Corton Marlene M, Leveno Kenneth J, Bloom Steven L, Spong Catherine Y, Dashe Jodi S. Williams obstetrics 24/E. E (EBOOK): McGraw Hill Professional. 2014 . Vahratian A., Misra V. K., Trudeau S., Misra D. P.. Prepregnancy body mass index and gestational age-dependent changes in lipid levels during pregnancy. Obstetrics and Gynecology. 2010; 116 : 107-13 . Kwiterovich P. O., Cockrill S. L., Virgil D. G., Garrett E. S., Otvos J., Knight-Gibson C.. A large high-density lipoprotein enriched in apolipoprotein C-I: a novel biochemical marker in infants of lower birth weight and younger gestational age. Journal of the American Medical Association. 2005; 293 : 1891-9 . Jiang S., Jiang J., Xu H., Wang S., Liu Z., Li M.. Maternal dyslipidemia during pregnancy may increase the risk of preterm birth: A meta-analysis. Taiwanese Journal of Obstetrics & Gynecology. 2017; 56 : 9-15 . 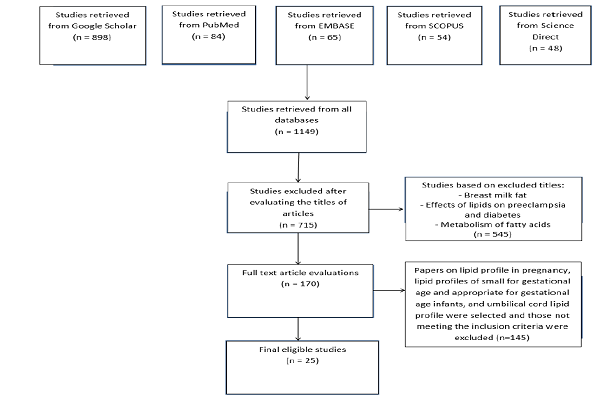 Moayeri M., Heida K. Y., Franx A., Spiering W., de Laat M. W., Oudijk M. A.. Maternal lipid profile and the relation with spontaneous preterm delivery: a systematic review. Archives of Gynecology and Obstetrics. 2017; 295 : 313-23 . Roozbeh N., Abdi F., Amraee A., Atarodi Kashani Z., Darvish L.. Influence of Radiofrequency Electromagnetic Fields on the Fertility System: Protocol for a Systematic Review and Meta-Analysis. JMIR Research Protocols. 2018; 7 : e33 . Lo Carson Ka-Lok, Mertz Dominik, Loeb Mark. Newcastle-Ottawa Scale: comparing reviewers’ to authors’ assessments. BMC medical research methodology. 2014; 14 : 45 . Roozbeh N., Banihashemi F., Mehraban M., Abdi F.. Potential role of Factor V Leiden mutation in adverse pregnancy outcomes: an updated systematic review. Biomedical Research and Therapy. 2017; 4 : 1832 . Vrijkotte T. G., Krukziener N., Hutten B. A., Vollebregt K. C., van Eijsden M., Twickler M. B.. Maternal lipid profile during early pregnancy and pregnancy complications and outcomes: the ABCD study. The Journal of Clinical Endocrinology and Metabolism. 2012; 97 : 3917-25 . Catov J. M., Bertolet M., Chen Y. F., Evans R. W., Hubel C. A.. Nonesterified fatty acids and spontaneous preterm birth: a factor analysis for identification of risk patterns. American Journal of Epidemiology. 2014; 179 : 1208-15 . Kaser S., Ebenbichler C. F., Wolf H. J., Sandhofer A., Stanzl U., Ritsch A.. Lipoprotein profile and cholesteryl ester transfer protein in neonates. Metabolism: Clinical and Experimental. 2001; 50 : 723-8 . Steffen K. M., Cooper M. E., Shi M., Caprau D., Simhan H. N., Dagle J. M.. Maternal and fetal variation in genes of cholesterol metabolism is associated with preterm delivery. Journal of Perinatology. 2007; 27 : 672-80 . Toleikyte I., Retterstøl K., Leren T. P., Iversen P. O.. Pregnancy Outcomes in Familial HypercholesterolemiaClinical Perspective: A Registry-Based Study. Circulation. 2011; 124 : 1606-14 . Liu X., Du J., Wang G., Chen Z., Wang W., Xi Q.. Effect of pre-pregnancy body mass index on adverse pregnancy outcome in north of China. Archives of Gynecology and Obstetrics. 2011; 283 : 65-70 . Baker A. M., Haeri S.. Estimating risk factors for spontaneous preterm delivery in teen pregnancies. Archives of Gynecology and Obstetrics. 2014; 289 : 1203-6 . Zohreh Aghaie, Sepideh Hajian, Fatemeh Abdi, 2018.